It’s coming up to Australia Day – January 26 – an opportunity mined by Meat and Livestock Australia. 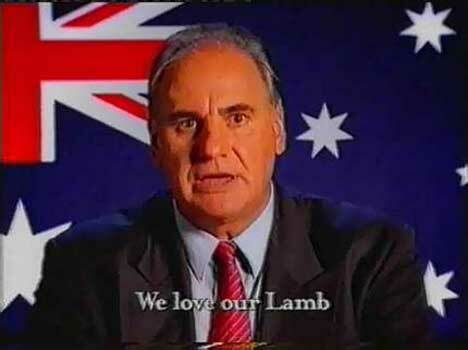 Sam Kekovich, an ex football player, gives us a 60 second rant on how eating lamb is the patriotic thing to do. It’s a bit of a laugh of course. Which becomes obvious as Kekovich slings off at ‘soap-avoiding, pot smoking hippy vegetarians’. And then there’s the shot at long-haired dole bludging types indulging their pierced taste buds in all manner of exotic, foreign, often vegetarian cuisine – chicken burger value meals, pizzas, a number 42 with rice. The ad’s certainly got people talking. I heard a few comments on talkback radio this week – as vegetarians and meat eaters responded with chagrin or with humour. The Advertising Standards Bureau has had a small number of complaints about vilification against vegetarians but has decided to leave the ad on air until next Wednesday. It’s all online of course. See the 60 second and 90 second versions at Meat and Livestock Australia. Advertising agency BMF created the campaign, with executive creative director Warren Brown, art director Dale McGuinness, copywriter Dennis Koutoulogenis and Producer Tamyson Power. Filming was shot by director Phil Rich via Two Feet Films. “UnAustralian” won a Bronze Lion at the Cannes 2005 Advertising Festival. Damian Davis in his January 27 2005 article at Crikey points out he and Nick Price developed the creative concept behind Sam’s rant back in the days of ABC’s The Fat editorials. Every script in The Fat finished with the line, “You know it makes sense”. The material was published on CD and in a book. See the Sam Kekovich rant provided for the BMF Christmas card to its clients – written up here at Duncan’s TV Adland. Sam’s back on TV screens in January 2006 with a repeat of the Australian lamb campaign. The ad can be seen at The Main Meal site as a 4.93 mb mpg file.